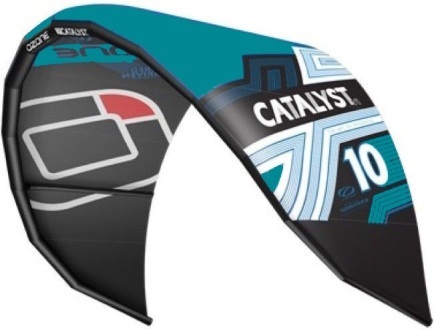 A kite for entry level kitesurfers, freeriders and waveriders. An allround kite which is easy to handle and relaunch. The same feeling for all sizes. 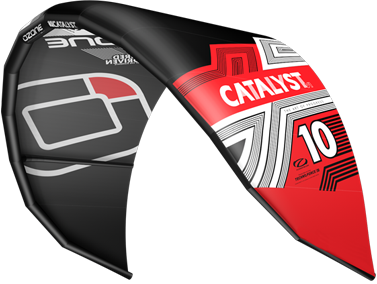 Ozone uses durable materials in the Catalyst to enfors it and increase kite endurance. 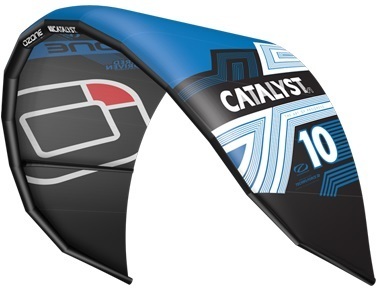 Entry level kite that with enough performance to allow major growth of the rider. Wind: 4-5 Bft. / 12-18 Kts. 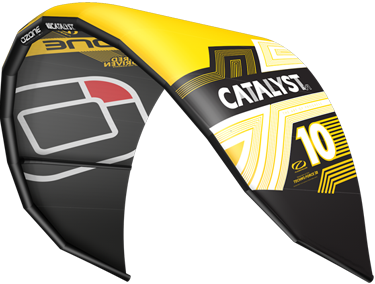 When Ozone developed the 2010 Catalyst they set themselves the goal to create a light and dependable kite. They succeeded in both. The Catalyst is light, something you feel immediately once inflated. By using durable materials in a three strut setup they saved quite some weight. The Catalyst is both an entry level and performance kite. The Catalyst is easy to control and safe to use due to the gradual power buildup. As a wave kite it's dependable and with its four line bar safer than 5 lines when crashing the kite in the waves. One thing we did notice is that the turning circle is a bit large, but this can be compensated by providing it with a more extreme steering input. Steering commands are directly translated into action, so a very responsive kite. On top of that you'll find the 2010 Catalyst to be stable and completely depower able. So looking at all characteristics we believe that this is a kite suitable for beginning kitesurfers and freeriders.